In a reverse to most stories about global warming and erosion damaging our lighthouses, an inactive lighthouse in Estonia, the Kiipsaare Lighthouse on the island of Saaremaa, has actually straightened up due to erosion. The tower, constructed in 1933, began to list to one side (due to erosion) around 1991. A comparison of photos taken in 1981 and 1990 shows that the coastline had eroded at a rate of three meters (about 10 feet) per year. As the water edged closer to the lighthouse, the waves slammed the tower, and sucked the sand from underneath the base. A story in the Batic Times says the return to the straight and narrow was first noticed by a keeper at a nearby nature preservation center on January 25 of this year. 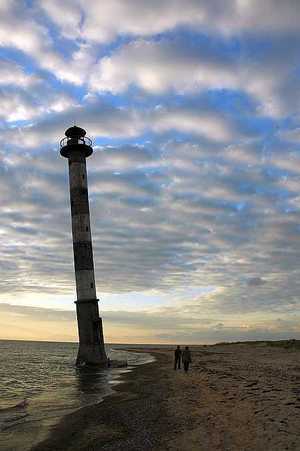 A pronounced list to the seaward side of seven to nine degrees, as seen in the photo, caused some people to refer to it as the “Pisa Tower of Saaremaa.” Kaarel Orviku, a geologist, said that the same forces that caused the seaward side to be washed away have done the same to the landward side, and thus the tower has turned slightly clockwise around its axis and leaned back toward the land. As of 22 February, the lighthouse was so straight the list, estimated to be now at one degree, was so slight as to be indiscernible. And it was just in time for the celebrations of the Republic of Estonia’s 90th anniversary celebrations. The people who live on the Eastern shore of the Baltic Sea are no strangers to adversity. Historically plagued by invading armies and oppressors, from the Teutonic Knights to the Czars of Russia, the three Baltic nations struggled continuously to retain their autonomy. In 1918 it seemed that their hopes for permanent independence would be realized. The armies of Latvia, Lithuania and Estonia had heroically expelled both the Russians and the Germans from their homelands. By 1922 the Baltic people had won world-wide recogition for their independence. The Soviet Union signed several treaties acknowledging their sovereignty. Yet by 1940 they were no longer free. During their brief period of independence the Baltic people gained a high degree of personal freedom and economic prosperity. Their standard of living was among the highest in Eastern Europe and illiteracy no longer existed. In addition the Baltic nations contributed fully to the world community through the League of Nations. The overall conditions that existed in Russia during this time were many years behind those in the Baltic States. The ominous growth of the German and Russian superpowers, both militarily and politically, sealed the fate of the strategic Baltic area. In the German/Russian nonagression pact of 1939, Germany secretly ceded the Baltic Republics to Russia, on the condition that Germany would be allowed to process the extradition of ethnic Germans (Volksdeutsch) from those areas. In the Autumn of 1939 the three Baltic governments were forced to permit the garrisoning of some 100 thousand Soviet troops in their countries. Starting with Estonia the Russians had lined their troops along the borders and blockaded the seaport of these nations until they were forced to concede. Finland, faced with similar ultimatums was in a posistion to resist. The result was the Winter War of 1939-40, in which tiny Finland sorely humiliated the victorious Russians. Estonia shows that it is perfectly possible to be a patriot and good European at the same time. As a race, they exhibit manifest evidences of their Ural-Altaic or Mongolic descent in their short stature, absence of beard, oblique eyes, broad face, low forehead and small mouth. In addition to that they are an undersized, ill thriven people with long arms and thin, short legs. Well, what has changed 95 years later ? The short answer would be that at least the legs have grown longer. I am sure they must have done .. ! History arrived late in Estonia. The Romans never reached so far, though Tacitus described Estonians as living on the verge of the civilised world (as well as making some nasty observations, in his Germania, about the Finns). Christianity first triumphed here almost 1,000 years after St Augustine arrived in the British isles in order to become the first archbishop of Canterbury. But let us not to be misled. Paradoxically, Estonia is both an old country and a young state. The history of the Estonians dates back more than 50 centuries, but it was only in the aftermath of the first world war, on February 24 1918, that the Estonian state was born. Infinity, the high-end division of Japanese car maker Nissan, will set foothold in Bulgaria in October 2008, Dnevnik reported on February 28. The second phase of Infinity's march onto European markets will start on January 2009 and will cover Sweden, Estonia, Latvia, Romania, Israel and the Czech Republic. Three months later, in April 2009, Nissan's luxury division is expected to have representative offices in Germany, the UK, Ireland, Lithuania, Finland and Slovakia. Infinity will offer four car models, all of which will be showcased at the car expo in Geneva in March. The second generation of the FX cross-over is expected to prove the biggest hit with experts and buyers. We just got back from our talumaja in Põlvamaa and I have to say, it's always so depressing to come back to Tallinn. I find I'm happiest in the smaller towns and villages of Estonia. I have an affection for towns like Põlva and Võru and the villages surrounding them. These places seem to be comfortable in their own skin. They enjoy being small Estonian towns and I can appreciate that. The people are friendly and don't mind stopping to chat for a bit. Driving around the pothole laden back roads of these rural areas I love seeing the chimney smoke rising from the small talumajad that dot the land. I get an emotional warmth from that landscape. The air is crisp and clear and with a serene quietness only broken by the occasional bark of a distant neighbors dog. When I walk into the house my birch burning ahi gives off a heat to the log walls and surrounding air like no radiator ever could. Sitting in our sauna nestled against the forest wall is heaven. The vice-mayor of Tallinn said that passengers on public transport should go to jail for ten days if they do not buy a ticket and then fail to pay a 600-kroon (£30) fine. A lack of resources means the city has few ticket inspectors. The city of Tallinn wants to throw passengers who don't buy bus and tram tickets behind bars. Vice Mayor Jaanus Mutli said passengers caught without tickets could face a minimum 10 days in jail if they fail to pay the 600-kroon fine (USD58,00 ; EUR 39,00) currently levied for the violation. "We want to send a message to all those who find it acceptable to travel at someone else's expense," Mutli said in a statement, stressing that current legislation says the offense is punishable with jail time. It's easy to ride for free on Tallinn's public transportation system because passengers do not need to present tickets upon entering buses, trolleys and trams. A limited number of controllers make random checks. Some 25,000-30,000 "rabbits" — the nickname for passengers without tickets — are caught every year in Tallinn. TALLINN - The Estonian Port of Tallinn, the Baltic Sea's biggest cargo and passenger operator, said its net profit fell by one fifth in 2007 as trade with Russia slumped amid a bitter political row. The state-owned group said that its profit fell by 21% from the 2006 figure, dropping to EEK 336 mln (EUR 21.5 mln, USD 32.5 mln). "Since last May, Russian companies that used Estonian ports have tried to decrease transit via Estonia," Port of Tallinn spokesman Sven Ratassepp told Agence France-Presse. The fall-off was most pronounced in August and September, when the group's profits slid by 40% compared with the same months in 2006, Ratassepp explained. "The total cut in Port of Tallinn's net profit in 2007 was 21%, and the trend is not changing. Russian companies still use Estonian ports much less than they did before May 2007," he said. Last year relations between Estonia and Russia plunged to their lowest point since 1991, when the Baltic state regained independence from the collapsing Soviet Union after five decades of rule from Moscow. The spark was Estonia's decision at the end of April to move a Red Army war memorial from the centre of Tallinn to a military cemetery. Although Moscow denied it slapped sanctions on Estonia, trade between the two neighbours fell sharply after the monument was moved, with the transit sector the hardest hit. Port of Tallinn is made up of five constituent harbours in the Estonian capital and elsewhere in the country. Estonia and neighbouring ex-Soviet Lithuania and Latvia were significant conduits for Soviet trade with the West. The three countries, which all joined the European Union in 2004, have remained major outlets for Russia since independence. Russia, however, has warned it may stop shipping exports through the Baltic states over coming years as it upgrades northwestern ports such as its Barents Sea hub in Murmansk. 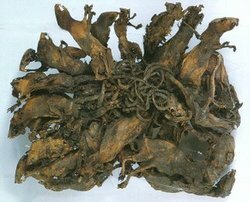 Rat kings are cryptozoological phenomena said to arise when a number of rats become intertwined at their tails, which become stuck together with blood, dirt, and excrement. The animals consequently grow together while joined at the tails, which are often broken. The phenomenon is particularly associated with Germany, where the majority of instances have been reported. Most researchers presume the creatures are legendary and that all supposed physical evidence is hoaxed, such as mummified groups of dead rats with their tails tied together. Reports of living specimens remain unsubstantiated. One theoretical cause for the phenomenon is cramped living space ; young rats might live too closely together, becoming inextricably entangled. However, the normal behavior of rats, which generally seek their own comfort, speaks against this theory. No scientific study has been performed to prove a natural cause of the phenomenon. Most extant examples are formed from black rats (R. rattus). The only find involving sawah rats (Rattus rattus brevicaudatus) occurred on March 23, 1918, in Bogor on Java, where a rat king of ten young field rats was found. Similar attachments have been reported in other species : in April 1929, a group of young forest mice (Apodemus sylvaticus) was reported in Holstein; and there have been reports of squirrel kings.The Tartu Ulikooli Zooloogiamuuseum (Museum of Zoology in Tartu, Estonia) has a specimen. The Zoological Institute of the University of Hamburg allegedly owns a specimen. Tallinn - Estonian President Toomas Hendrik Ilves said Thursday he was sorry for misinterpreted remarks in a recent BBC interview that caused a storm of criticism from Estonia's Russian- speaking minority. "I'm really sorry that my words were interpreted as offensive toward someone's language or national feelings," Ilves told the Swedish news agency TT, according to Postimees (The Courier) newspaper. Estonia is a safe home for anyone whose native language is not Estonian, he said. The president faced sharp criticism for his remarks to the BBC, saying that learning Russian would mean downplaying the years of Soviet occupation. A spokesperson for the president said his remarks were misinterpreted. "Comparing the text of the publication with the transcript one can conclude that the journalist considerably freely utilized the original material," the Estonian Television website said on Thursday. The website of the Russian-language newspaper "Narvskaya Gazeta" published the transcript of the interview obtained from the BBC journalist Tim Whewall. "Speaking Russian, Ilves said firmly, would mean accepting 50 years of Soviet brutalisation because most Russian-speakers settled in Estonia only after it was occupied by the USSR towards the end of World War II," the BBC Web site quoted Ilves in its report. AgustaWestland is pleased to announce that Copterline of Finland has taken delivery of the first of two AW139 helicopters at AgustaWestland’s Vergiate facility. It will soon enter service operating scheduled flights between Helsinki, Finland and Tallinn, Estonia. The second AW139 is scheduled to be delivered in April this year. A new generation medium twin-turbine helicopter setting new standards in the medium twin market, the 12 to 15 seat AW139 has become the operators choice for scheduled helicopter services with leading operators worldwide ordering the helicopter as part of their fleet modernisation programmes. Over 100 AW139 helicopters are now in service worldwide with orders placed for more than 330 helicopters by over 80 customers to perform a wide range of roles in over 30 countries. The AW139 is the fastest helicopter in its class with a maximum cruise speed of 165 knots (306 km/h), reducing flight times while also providing greater passenger comfort due to its spacious cabin, low noise, low vibration levels and large windows. The AW139 also has the largest baggage compartment of any medium-twin helicopter (3.4 m3 / 120 ft3) with access from both sides of the aircraft for fast loading and unloading. Helisinki-Malmi Airport based Copterline was established in 1960 and it is one of the leading helicopter operators in Finland providing Helicopter Emergency Medical Services (HEMS) and high frequency scheduled flights on the Helsinki-Tallinn. The international hotel chain Swissôtel Hotels & Resorts has opened a new deluxe hotel in the Estonian capital today - the Swissôtel Tallinn, Estonia. The building is now the tallest in the Estonian capital, and offers spectacular views of the historic Old Town as well as across the Baltic Sea. The elegant 30-storey hotel lies within Tallinn’s financial quarter, the so-called “Wall Street of Tallinn”, and is consequently in the direct vicinity of leading banks and company offices. The Old Town with its distinctive cobblestones can be reached by foot in 10 minutes and was named a UNESCO World Heritage Site in the year 1997. The airport and the main railway station are also only 15 minutes away, and the passenger ferry terminal can be reached in only 10 minutes. In short, the hotel is ideally located for business and leisure travellers. The 238 rooms and suites are equipped with state-of-the-art technology, and offer sophisticated guests every possible amenity. Three executive floors, an executive lounge as well as meeting rooms provide favourable settings for the needs of business travellers. High-speed wireless internet access, ISDN and an espresso machine round off the fixtures and fittings of the luxurious rooms. KURESSAARE - An inactive lighthouse on the island of Saaremaa, dubbed the 'Pisa tower of Saaremaa' in emulation of Italy's famous leaning landmark, appears to have returned to the straight and narrow. The straightening of the lighthouse was first noticed by a keeper at a nearby nature preservation center on Jan. 25, a regional newspaper reports. As if timing the correction for the 90th anniversary of the Republic of Estonia on Feb. 24, the lighthouse was by Feb. 22 so upright it was measured to be leaning at an angle of only one degree. Kaarel Orviku, a geologist who has been studying coastal processes in the Harilaiu peninsula for decades, said that the Kiipsaare lighthouse had only adopted its deviant tendencies since 1991, having stood proud and ramrod straight since its construction in 1933. A comparison of aerial photographs taken in 1981 and 1990 shows that during that period the coastline receded by three meters a year until finally reaching the foot of the lighthouse, Orviku said. Czar Alexander III is going home to Estonia. An 1884 oil painting of the Russian ruler was snapped up for $80,000 Thursday at Kilshaw's auction house by an Estonian bidder who joined the Victoria auction event by phone. He was one of three Estonians who phoned in to try to buy the impressive portrait, done by Russian artist Johann Koler. "We had live phone bidders from all over the world," said Alison Ross of Kilshaw's. Other paintings by Koler (1826-99) have sold recently for up to $120,000. His portrait of Czar Alexander III, Russia's emperor from 1881 until his death in 1894, has a distinct connection to Estonia. "I believe it may have been commissioned by the Estonians as a gift to Czar Alexander III," Ross said. 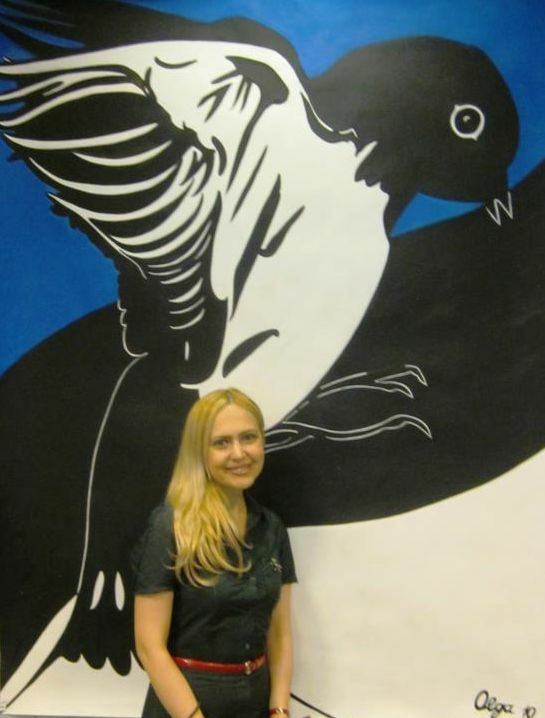 "Right around that time that did happen, and with Koler being the father of Estonian painting, it's very likely that they would have commissioned him." IT started with buying a stranger a drink after Scotland's World Cup qualifying match in Tallinn in 1993. That led to Iain Lawson building a Baltic network of business contacts, buying Estonia's former national pest control service, and becoming that country's consul general in Scotland. Lawson couldn't have known that the local who persuaded the barman to keep the beer flowing for the Tartan Army was economic adviser to the Estonian prime minister. That simple border-busting gesture of thanks would open up a world of opportunities in one of the most dynamic pockets of the New Europe. Now Lawson is aiming to encourage other Scots businesses to follow his lead when he takes a leading role part in the Conference on New Europe being organised by the Scottish Council Development and Industry (SCDI) and Scottish Enterprise in Edinburgh next month. The largest gathering of Eastern European and Scottish diplomats and trade bodies ever held in Scotland, the New Europe event aims to wake Scots businesses up to the red-hot export and growth opportunities on our doorstep. "There have been massive changes in Eastern Europe but there are still great opportunities," Lawson said. TALLINN - Prime Minister Andrus Ansip has said that in order to switch to the euro the government might be forced to freeze public sector salaries beginning in 2009. “If we want to accede to the eurozone in 2011 we must resolve to curb the growth in the salaries of people working in the public sector, starting next year,” the prime minister told a press conference on Feb. 21. Answering a question of a BBC correspondent about why the Estonian president does not speak Russian, the language spoken by more than a quarter of the population, Toomas Hendrik Ilves said it was impossible, because it would mean accepting the 50-year-long cruelty of the occupation, reports the Estonian television ETV 24. Most Russian-speaking people were brought to Estonia only after the country was occupied by the Soviet Union after World War II, the president told the BBC correspondent. Earlier, during his visit to Ida-Virumaa (a Russian-speaking area in Estonia) in November 2006, President Ilves told Russian residents of the area : “Living in Estonia, you are our compatriots. I stress : our compatriots, but not compatriots of the Russian government. This means that your concerns are our concerns but concerns of the Russian government or the Russian president. We cannot do without you. Estonia is too small to be indifferent to its compatriots.” During his visit to Russian-language schools the president noted that he would not that Russians who moved to Estonia and their descendants feel alien in the country. It is worth mentioning that Ilves is the first Estonian president who does not speak Russian. Apart from speaking Estonia, English and Finnish, the president is studying French at the expense of the government. His grandmother was Russian. At the peak of Latvia's housing boom in 2006 speculators were slapping deposits down on 10 off-plan Riga apartments and doubling their money by selling them before they had even been built. Now prices in Riga and Tallinn are sliding and Vilnius's property market is topping out, leaving late investors with burnt fingers and raising fears that the housing slump could trigger a wider economic "hard landing". The property markets of the Baltic states, like their economies, have boomed so spectacularly because they are tiny and there was so much pent up demand to move out of grim communist-era tower blocks. Easy credit from banks fighting for market share, as well as rapidly rising wages - up by more than 30 per cent last year in Latvia - merely lit the touch paper. As always, Tallinn in Estonia - the smallest and most picturesque of the three Baltic capitals - led the way. A typical price for a renovated apartment in Tallinn's medieval old town is now about €5,000 per sq m.
Riga, the largest and busiest capital, grew the quickest. Most of its Jugendstil (Art Nouveau) mansion blocks have been restored to their former glory and annual house price inflation in the third quarter of 2006 was the fastest in Europe at 57 per cent, according to Knight Frank. TALLINN - A Russian internationally certified aircraft, Antonov An-30B, will perform a monitoring flight over Estonia within the framework of the Open Skies Treaty on Wednesday, the press service of the Estonian Defense Forces' General Staff told Interfax. A panoramic survey camera will be mounted on the aircraft. All data will be developed in the presence of Estonian controllers in Russia, and one copy will then go to Estonia. The crew of the aircraft, including observers, is 27 people. They will be accompanied by Estonian observers, who will monitor the activity of their Russian colleagues, as well as that the aircraft follows the earlier defined route. Russia performed monitoring flights within the framework of the Open Skies Treaty in 2005, 2006 and 2007. Estonian and Finnish observers flied over Russia in August 2007. Estonia signed a deal Tuesday with the United States that paves the way for radiation detection instillations at Estonia's borders to prevent nuclear smuggling. The announced agreement between top officials at the U.S. Department of Energy's National Nuclear Security Administration and the Estonian Tax and Customs Board moves forward a proposal to install new radiation detection and integrated communications equipment at multiple border crossings, airports and seaports in Estonia, the National Nuclear Security Administration reported. "NNSA is committed to detecting and deterring attempts to smuggle nuclear materials or devices into the United States or other countries around the world," NNSA Deputy Administrator for Defense Nuclear Non-proliferation William Tobey said in a statement. "Our agreement with Estonia is another opportunity to build upon our international partnerships to do so." Russia could be sliding into dictatorship as Germany did soon after World War I, Estonian President Toomas Hendrik Ilves has warned. "There is a mentality of being stabbed in the back that reminds me of the Weimar Republic," Mr Ilves told Russia's Moscow Times newspaper. The Weimar Republic is the name given to the German state in 1919-1933 - before Adolf Hitler's rise to power. Estonia-Russia ties have been tense since the collapse of the Soviet Union. Last year, Tallinn and Moscow had an all-out row over the relocation of a Soviet-era war memorial in the Estonian capital.